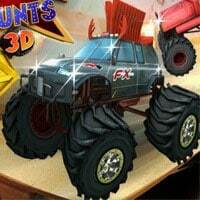 In Ultimate Stunts 3D Game: The arena for tonight Monster Truck Show is already prepared for the first contestant. We all expect an amazing night full of incredible acrobatic tricks with these big cars. Show off in the best light you possibly can. Thousands of eyes are watching over you in Ultimate Stunts 3D Game. Show the spectators your sick skills, show them something they have never seen before. Stun the audience with unreal tricks, such as twister, roll 360, chopper and theirs combinations. So will you manage to successfully complete all 20 levels? Add the most points possible for the most difficult combos. Enjoy and have fun. Ultimate Stunts 3D Game is one of our Driving Games at Round Games. It also tagged as a 3D car game. To play even more free games, view our most played and all games pages. If you want to play more games like this game: Then you can simply check out the games inside the game tags that are the most relevant to your interests or check the Driving Games category or check the related games section at the end of the game page.